The picturesque nature of our vast country has always attracted artists from almost the entire world. Of course, beautiful and picturesque corners can be found most often in the mountains or near rivers. After all, it is not by chance that Levitan chose this particular area for his work. The author wanted everything to be organic in the picture, so he wrote it so that the small features of the picture were highlighted. Therefore, if you look closely, you can see how the author emphasized the outlines of the floating clouds, which not just fly over the lake, but also fill everything around with fresh aroma. Thus, the artist managed to create a sense of nature, able to wake up everything around. Looking at the artwork, one can imagine that somewhere the air is waving small grass, rustling the leaves and gradually everything begins to revive around, and as if reborn again. We see nothing special here; perhaps someone is watching this picture forever. But the way the creator managed to convey all the beauty and singularity of this place with the help of a brush deserves special praise. 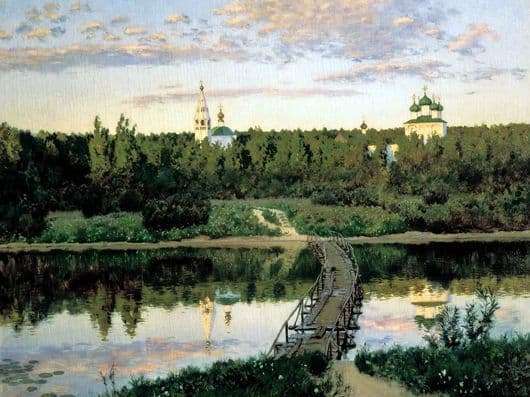 That’s why, having painted a picture, Levitan set a goal, to show how diverse and beautiful the place where you live constantly can be. Indeed, in the bustle of events, we often do not notice. The artist urges you to look around more often and not forget that you can find something interesting and unpredictable. So, at the first look at the picture, we clearly see that the artist depicted the summer landscape. We see how clouds float slowly and serenely, as if a mild wind helps to pave the way for the sun. Fully lit forest has become stronger and wider. He did not just become so, he is more reliable and perfect. Among the tall trees we see the chapels of churches that seem to have been lost in them. The sun throws the rays on the green domes of the monasteries, and they in turn give a beautiful emerald hue. Through the river stretches a bridge that connects the two banks. Thanks to him, you can once again find yourself on the beach with a green grove. Therefore, the artist carefully managed to match the colors, thanks to which he revived nature.